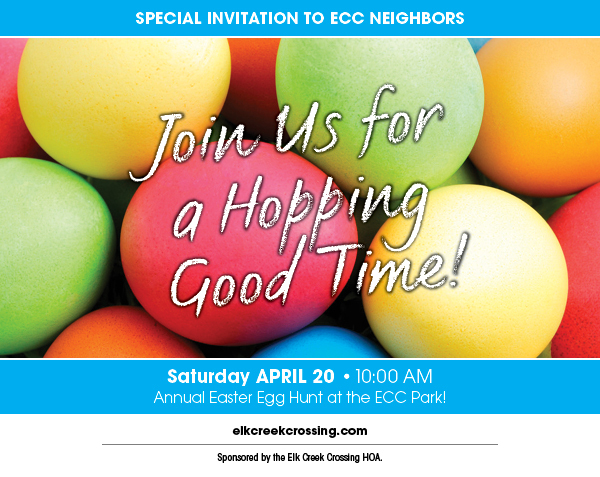 Join us for Elk Creek Crossing’s Annual Easter Egg Hunt at the ECC Park! DON’T FORGET TO BRING YOUR EASTER BASKET! Rain or shine (with the exception of extreme weather). Watch this post if chance of cancellation. VOLUNTEERS NEEDED! Can you help prep or hide the eggs? BUY & STUFF THE EGGS: Purchase plastic eggs, fill with candies and bag for transport. KEEP YOUR RECEIPTS – you’ll be reimbursed for expenses once submitted. If you can volunteer to hide them also, follow the steps below. If you can’t, please coordinate drop-off of filled eggs to Egg Hunt organizer, Ann Smith. HIDE THE EGGS: Meet promptly at the ECC park at 8:00 am Saturday, April 20th to hide the eggs. Families start arriving typically by 9:30 am so we want to be done prior to that. If you’ve volunteered to stuff eggs, don’t forget to bring them with you! HOW TO VOLUNTEER: Ready to help? AWESOME SAUCE! Please fill out the form below, including a note on whether you can: STUFF eggs (if so how many), HIDE eggs or I CAN DO BOTH. Thank you! Sponsored by the Elk Creek Crossing Homeowner’s Association. Previous Sat, May 4, 2019: FREE Dump Site – VOLUNTEER NOW!